With Korean Air Lines Co. without a captain after its chairman died soon after losing his board seat, its rival Asiana Airlines Inc. is now up for sale after its parent was forced to yield the flagship company to creditors in return for another financial bailout, putting a strain on the traditional family ownership of Korea’s two largest carriers in the face of heavy competition from budget airliners. Kumho Industrial, the holding entity of Asiana Airlines, in a board meeting Monday approved the plan to shed its 33.5 percent stake in the airliner, worth around 300 billion won ($264.6 million) in current market value. 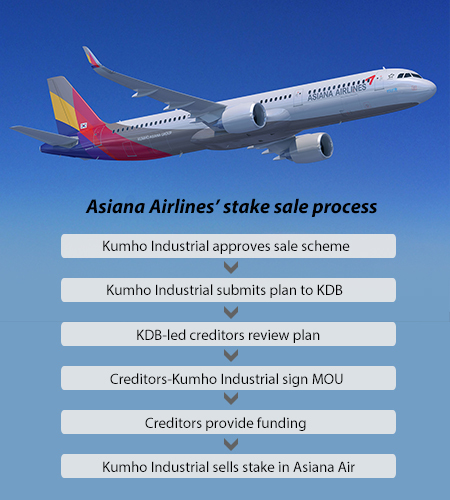 After creditors rejected its self-rescue plan, Kumho Asiana Group on Sunday drew a new outline proposing to throw in its stake in Asiana Airlines to creditors led by state-run Korea Development Bank (KDB). Asiana Airlines` split from Kumho Industrial would also entail a divorce from the founding family. Kumho Buslines Co., owned by Park Sam-koo and family members, wield control over the airliner and its units through a 45.3 percent stake in Kumho Industrial. Park stepped down as group chairman and chief executive of Asiana Airlines and Kumho Industrial last month to take responsibility for the accounting fiasco involving the carrier unit, passing the helm to his eldest son. Asiana Airlines shares rose by the 30 percent daily limit to close Monday at 7,280 won. Kumho Industral gained 29.6 percent to finish at 15,100 won. In return for the stake in the airliner, Kumho Asiana Group has asked for fresh funding of 500 billion won in the form of purchase of perpetual bonds that can later be converted into equity stake. Creditors may increase the funding depending on their influence in the sale process and interests in the airliner after it is sold, sources close to the matter said. The immediate funding would be used to pay off debt, including 60 billion won of Asiana bonds that mature on April 25, and also to ease liquidity for other Kumho units. The stake sale could be followed by a possible option for the new buyer to recapitalize up to 1 trillion won to shore up the airline’s financial base, according to creditors. The logistics-focused group was forced to come up with a fresh restructuring plan after the creditors last week struck down its initial proposal to put up as collateral the founding family’s controlling stake in Kumho Buslines and to sell Asiana Airlines if it failed to implement its normalization plans over the next three years. Asiana Airlines’ main creditor KDB claimed the offer was “insufficient to restore market trust” and called out for more practical measures to improve its troubled finances, such as the sale of the owner family’s personal assets or the issue of new shares. Kumho Group, without its flagship airliner, would shrivel to a mid-size entity from its current standing as Korea’s 25th largest conglomerate by assets. Asiana Airlines holds a sizable stake in a host of affiliates, including 44.2 percent and 100 percent of budget carriers Air Busan and Air Seoul, respectively. It also holds a 76.2 percent stake in Asiana IDT, an IT service provider, and 80 percent stake in Asiana Saver, a computer reservation system operator. Other wholly-owned subsidiaries include Asiana Airport, a ground handling services firm, and Asiana Development, a logistics company. Last year, the carrier raked in 6.2 trillion won, accounting for 63.7 percent of the group’s total revenue. Sales of Kumho Industrial stopped short at 1.38 trillion won and Kumho Buslines at 423.2 billion won. As of late 2018, Asiana Airlines’ assets totaled 6.93 trillion won, making up 60 percent of the group total. Kumho Industrial followed with 1.17 trillion won, Air Busan 302.2 billion won, and other affiliates 3.1 trillion won.